Hello loves, another new review post is up.. Well its no new brand in this post I'll share about my review on Bioderma Sensibio H2O. I know this is no longer any new brand and you might already know about this brand and product or have even tried it out yourself but to be honest this was the first brand that I've tried when I first came across micellar water. Before I would use cleansing milk to wipe off my makeup before moving in with the facial foam because I love double cleansing however after encountering micellar water its totally life changing! I know it sound dramatic but with micellar water you can skip rinsing again (you know we girls live anything practical but I would really suggest you to do double cleansing) and it leaves your skin feeling smooth and fresh . Bioderma Sensibio H2O as said is no longer any new brand, despite it may be one of the well know brand for micellar water in the market as many beauty enthusiast or beauty vloggers and bloggers have been raving all about. This Bioderma Sensibio H2O is also known as one of the best micellar water in the market, which I can't disagree to. They're very gentle on the skin and is suitable for all skin type including sensitive skins. In this post I'll also share some very interesting offer for this product so make sure you read till the end. I was beyond delighted, when Sociolla sent me a box containing this Bioderma Sensibio H2O. It was the 250 ml which I can use for quite sometime :) this product is also very gentle that it doesn't stink on my skin especially on sensitive areas like eyes. This product was indeed meant to clean makeup on face, eyes and lips so no longer lots of different product to clean each part easily swipe this product all over your face and you're done cleansing. It also claims to be able to soothe and moisturize skin with high tolerance. Let's Give it a Test! After first swipe, all the shimmer eye shadow is gone and the rest are swiped off but not completely gone. The verdict is that this micellar water work wonders on my skin leaving it feeling clean instantly and it even lift waterproof makeups although several wipes is needed. After usage this product doesn't irritate my skin making it look fresh, clean and feels super smooth. Please note that I swipe it off gently if you use too much power you'll end up ruining your own skin because our skin are so gentle. Bioderma Sensibio H2O has always been my favourite micellar water but their price tag may get a little heavy but now you can get very special deals at Sociolla for Bioderma products. So here's the good news guys!! Get your Bioderma products at Sociolla, these promotions are available till 31 May 2017. 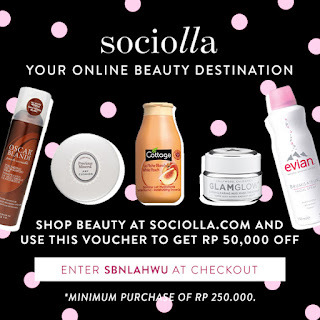 Besides this in house promotions by Sociolla, you can also get additional discount by quoting my code before checking out your shopping card SBNLAHWU to get Rp 50.000 off your purchase with a minimum of Rp 250.000.